Though our mild winter would suggest otherwise, March 20 marked the Vernal Equinox and the official first day of spring. It’s a good time to remember that everyone’s enjoyment of our trails, and the survival of local wildlife, depends upon respect of some common sense rules and regulations. Wildlife closures on BLM and State Wildlife Area lands at Animas Mountain, Bodo, Grandview Ridge, Sale Barn and Twin Buttes are in effect through April 15, and protect deer, elk, bears and coyotes. Perrins Peak – Bureau of Land Management and SWA – is closed through July 31 to protect Peregrine falcons. Please respect these closures. For some deer and elk it can be a matter of life and death. This time of year they are living off meager diets of available forage, but mostly surviving on last summer’s stored fat. It’s not much, and on average, they will lose approximately 30 percent of their body weight in winter, every year! With many does and cows being pregnant, disturbance by people, dogs, bikers and horseback riders force the animals to move and burn calories they cannot afford to during the day and still cold nights. These deer and elk rely on undisturbed winter range for survival and are different than “town deer” that have plenty to eat year-round. As was reported recently, (Herald, March 20), on Animas Mountain, one of the areas the BLM patrols adjacent to town, BLM law enforcement rangers issued 19 wildlife closure violation notices in 2016, 13 in 2017 and one violation has been issued through March 2018. 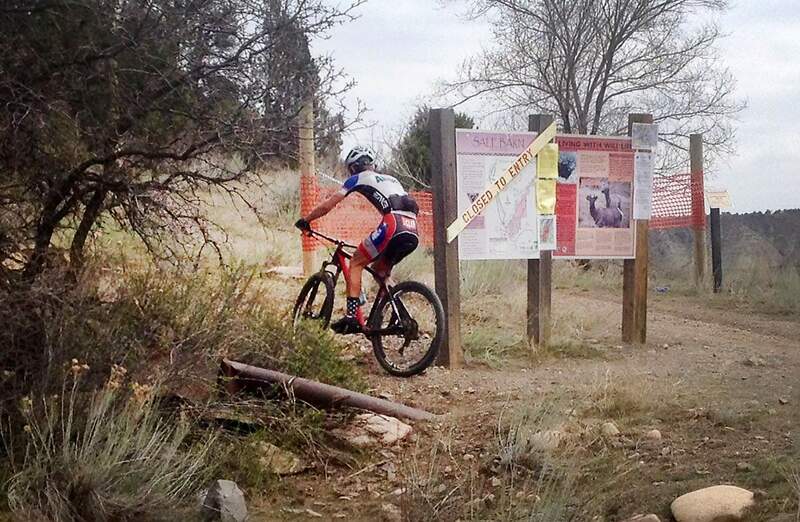 BLM data is not broken down by user, so it is unclear whether violations are being issued to hikers, mountain bikers, equestrians or a combination of users. Regardless, it’s up to all of us to comply with these closures. Last month, Trails 2000, with funding from a Colorado Parks and Recreation Association Partners in the Outdoor grant, in partnership with Colorado Parks and Wildlife, launched an educational campaign with just that message, “It’s up to me” (vimeo.com/259345985). Another, “Got Leash?” (vimeo.com/259346754), aims to encourage public land users to follow specific etiquette and safety on Durango’s area trails. A related problem, that of illegal trail-building (Herald, March 20), isn’t confined to a specific place or a single agency. Wherever it happens – on public lands or private – creating unapproved trails is against the law. That the odds of being caught and ticketed aren’t high doesn’t make the activity any more ethical or any less destructive. Public lands agencies must balance numerous complicated factors and diverse constituencies when they craft travel plans. They solicit public input. The end result satisfies no one completely, but it’s vastly preferable to the free-for-all that develops when users ignore restrictions. Thoughtfully regulated travel is the best hope we have for safeguarding wild lands while allowing recreationists to experience them. By all means, participate actively in the planning process, but if it doesn’t produce exactly the results you want, don’t go rogue and start cutting new trails. Let’s leave a lot of wild space between our well-traveled routes. A source of pride for all Durangoans, it is up to us and our local trail and cycling organizations, to reinforce respect for our wild lands, wildlife and all users. Happy trails!